Garcia Promotions returns to Humble, Tx on October 1 for Cage Combat 26. The card is headlined with two title fights. 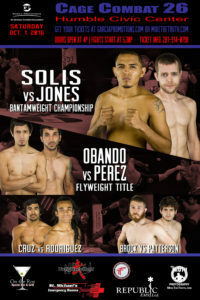 In the main event, Jose Solis and Casey Jones face off for the bantamweight title. Solis is currently on a two-fight winning streak. His most recent win came at Cage Combat 25 where he defeated Tony Nguyen via neck crank. Jones is also riding a two-fight winning streak. He recently won the Garcia Promotion’s Interim Featherweight title when he earned a split-decision win over Josh Altum at Cage Combat 25. In the co-main event, Francisco Obando and Dominick Perez face off for the flyweight title. Obando is undefeated at 3-0, with his most recent win coming at Cage Combat 25. Perez is also 3-0, with his last win coming at Cage Combat 25 where he defeated Colton Tijerina. You can get your Cage Combat and Fury tickets here at MikeTheTruth.com.